Make a well with the flour and add the fine salt. Dissolve the yeast in half a cup of warm water, letting it rest for a couple of minutes. Pour the yeast mixture into the well and add the sage and some of the rosemary. Begin working with the dough. Then add the oil and as much of the water as needed to make a soft dough. Continue working/kneading the dough until uniform and fairly soft, yet elastic. Place the dough in a bowl, cover with a dishtowel and let rise in a warm place for about an hour. Oil a baking dish, stretch the dough into it, and place the potatoes on the surface. 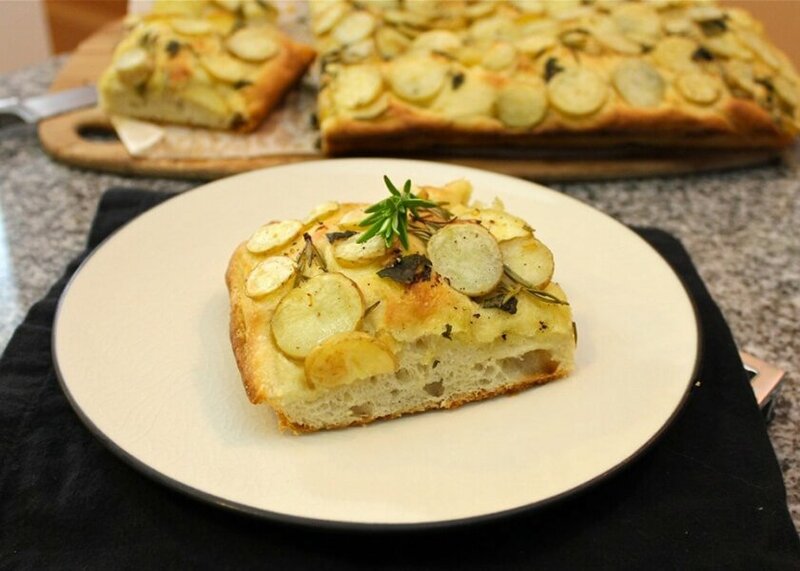 Brush the top of the focaccia with oil, sprinkle with coarse salt, the remaining rosemary and let rise for 20 more minutes. Bake in a 200° C (390° F) oven until the exterior is crispy.